Sailing is fun, but so is shore leave. Though many cruisers enjoy putting in at a marina or yacht club for an evening ashore, mooring lets you settle in for the night while still enjoying a restful evening on the bay. Moorings are plentiful at many popular sailing destinations. Some are free for the taking (pirate moorings), while others are privately maintained and are rented nightly. Free, unattended moorings are tempting, but their safety and security are often questionable. 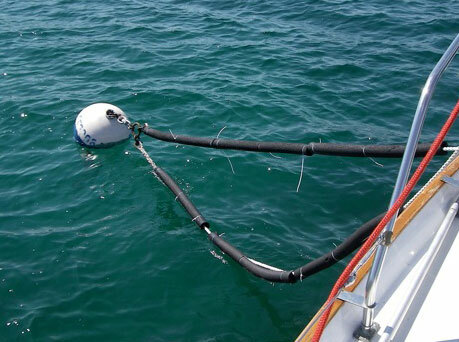 Select your mooring float carefully. If you are unsure, dive down and inspect the anchoring weight and the heft of the chain. You may want to provide your own tether for extra security. Places like Catalina Island off the coast of California, on the other hand, rent moorings to hundreds of cruising boats. Their moorings have bow and stern attachments, reducing swing room and allowing more boats to occupy the limited area. Moorings like those at Catalina Island and in areas of the US Virgin Island are often served by a boat taxi service. This allows boaters without dinghies to access shore amenities and businesses. The harbormaster usually visits via boat to collect rental fees, provide trash pick-up, and assist as needed. With hundreds of cruising boats, as well as local charter boats, seeking moorings, there is a daily race in popular places to secure a mooring in a good location. When possible, plan enough time in your sailing schedule to arrive early and secure a location.